Bring the fun of a world-famous science museum into your own classroom or home! Now you can do your own version of 23 Exploratorium experiments on force and motion. All you need is a little curiosity, a few simple materials . . . and this book. Each experiment is easy to do, fully illustrated, and loaded with advice, ideas, helpful hints, and electrifying discoveries. Build a pendulum that swings in intriguing patterns. Create a swirling, spiraling "tornado" of water. 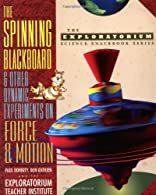 Through these and other projects in The Spinning Blackboard, you can learn the science behind the principles of force and motion.